In the days of yore, induction of fresh students in colleges and universities used to be a pleasant and enjoyable experience for the freshers as well as old students. It would open a new chapter in their life. Political leaders are known to taunt, ridicule and heap allegations on their opposite number in and out of legislature. In the jungle of politics, it is dog-eat-dog. But seldom one comes across ministers doing so while sharing the same platform and that too when both are from the same party, in this case, the BJP. To commemorate the supreme sacrifice of the freedom fighters in the mutiny of 1857, a state-level function is being organised in the district on September 23, on the martyrdom day of Rao Tula Ram. 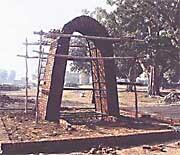 1857 war memorial being constructed in the newly developed Shahidi Park in Jhajjar. Student lost life due to rash police action? Two persons were killed and three injured seriously when a truck hit a Maruti Esteem car last night at Rao Tula Ram Marg. The police said that five persons — Ishav Kohli of Kamla Nagar, Shiv Vani of Sarita Vihar, Gagandeep of UP, Aman Bhalla of Pathankot and son of MLA Pathankot and Anurag Mehta of Aradhna Colony – were reportedly going to the Radisson Hotel to attend a party in a Maruti Esteem car. To effectively reach out to the underprivileged children, it is the mothers who need to be used as a means. Armed with this talisman, the Adopt A Mother Foundation today boasts of a reasonable number of families that have been taken under its wings for providing basic health and educational requirements. The Adopt A Mother Foundation started its first multi-functional centre in the slums of Neb Sarai in June 1999 with the aim of helping the deprived and the underprivileged. Deepak, a liquor contractor, was allegedly shot dead by car-borne miscreants near the STD booth of the bus stand in Farmana Majra village, about 15 km from here on Saturday. According to a report, the miscreants started firing indiscriminately, killing him on the spot. There are teachers and teachers. Some make their students the proud citizens of the country and set an example. Others themselves need to learn a lesson—in ethics. Noted personalities expressed the need for a change in lifestyle and consumption pattern to realise the goal of ‘sustainable development’ and to protect the environment. THERE was a time in Delhi when the Yamuna river used to bring floods to the city and its surroundings. 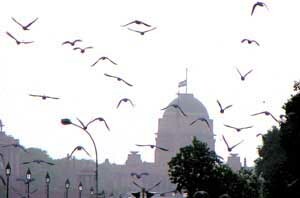 That was when the Yamuna flowed by the back walls of the Red Fort and moved on by the side of Darya Ganj. 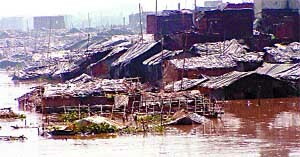 There were annual floods on a regular basis, of course after the usual warning by the district authorities who had prepared elaborate charts on the areas to be submerged. The Delhi Transport Minister, Mr Ajay Maken, said today that the Transport Action Plan for the Capital would be released on October 2. Mr Maken pointed out that the action plan would be made available for public discussion to the commuters as well as private transport operators. A couple who were severely beaten by criminals `hired’ by their landlord to forcibly evict them from a house in Ballabgarh town, has alleged that the police have also turned their back on them. While the wife has been admitted to the hospital in a critical state, the husband is running from pillar to post to get the accused arrested. The Delhi Chief Minister, Ms Sheila Dikshit, today left for Moscow and St Petersburg on a three-day official visit, as a follow up to the successful cultural exchanges in the last few years between the city of Moscow and Delhi. The seven-member delegation led by Mrs Dikshit would be discussing with the Mayor of Moscow issues relating to city transportation, particularly the linkages established by the Moscow Metro with related transport network. Expressing his deep concern over the traffic congestion in the city, Commissioner of Meerut Division N. S. Ravi summoned the Regional Manager of the UP State Road Transport Corporation in the office and warned him against illegal parking of the UPSRTC buses on the road outside the bus stand. Mr Ravi asked why the roadways buses were parked on the busy Delhi road to which the Regional Manager could not give any satisfactory reply. After the North-East district police arrested Hemraj alias Hemu, a member of Dabbu gang involved in the Mudrika bus dacoity near Delhi Cantonment on September 5, the South district police today claimed to have arrested five others who were involved in the dacoity. The police claimed to have recovered one Maruti Van and three knives from their possession. However, the leader of the gang involved in the bus dacoity managed to escape along with another associate Naseem. AQUAGUARD has launched Aquaguard i-Nova, India’s first state-of-art-water purifier with futuristic technology. Milind Vaidya, vice-president, Business Development said, “Eureka Forbes has always been recognised as a company that offers its customers the latest technology and variety when it comes to household health and hygiene products. Our latest offering, the i-Nova is one-of-its-kind ‘intelligent’ water purifier which comes with its own mini-brain that warns the machine when its needs attention and automatically places a call to the service centre through an existing telephone line. In a representation to the Insurance Regulatory and Development Authority, the PHDCCI has said that the premium in case of private cars and two-wheelers should have been reduced in lieu of the introduction of compulsory excess resulting in elimination of smaller claims. JAPANESE delegation belonging to the World Peace Prayer Society visited the GHPS, India Gate. The students were addressed by member of the delegation Ms Kazuko Miyagawa, who informed that the 11-hour journey from Japan to India, was a pilgrimage undertaken to spread the message of peace in the world. A pillar was also erected in the school premises with the message ‘May Peace Prevail On Earth’ inscribed on it in Hindi, English and Japanese. 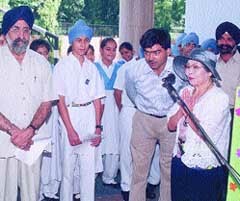 Namaste: A delegate from the Land of the Rising Sun addressing the students of GHPS, India Gate. THERE is always a silver lining in any gloomy situation provided you starve the problem and feed the opportunities. All you need is a positive attitude and the moral courage to put your dreams together to move on. Remember every cloud has a silver lining that promises joys. The clouds that block the sunshine from your life are transient but they are needed because together with the rain and the sunshine they go on to make a rainbow. Sarthak Gandhi of Apeejay Public School beat Kunal Kathuria of Hansraj Model School 11-6, 6-11, 11-7, 12-10 to win the Kids title in the 14th Jaspal Kaur Memorial Table Tennis Tournament at the school premises on Sunday. Shastri Club defeated Uttaranchal Club 4-0 in an A Division match of the Delhi Soccer Association (DSA)-SAIL Open Club Football League at the Ambedkar Stadium on Sunday. A dashing knock of 40, studded with six fours and one six, by Puneet Bisht and deadly bowling by Varun (4 for 14) helped K N Colts Club score their second victory when they beat Mont Fort School by one run to enter the quarter-final of the Shaheed Smriti Under-19 Cricket Tournament for the Rameshwar Trophy at the Mont Fort School ground, Ashok Vihar. 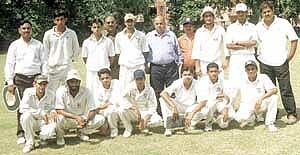 Secretary of the Himachal Pradesh Cricket Association R R Rohi with Scindia Club and Mont Fort players. Mount St. Mary’s School beat Heera Public School by 246 runs in the opening match of the third Parle Cup Inter-School Under-17 Cricket Tournament at the Mount St. Mary’s School ground. Y Sanjeev Singh of Border Security Force and Mayna Karmakar of Central Reserve Police Force emerged winners in the men’s and women’s section respectively in the Delhi State Triathlon Championship held at the Talkatora swimming pool complex on Sunday. The competitions were held in swimming, cycling and running. 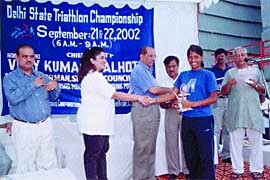 AICS chairman V. K. Malhotra presenting the trophies to triathlon winners in the Capital. Following the vacation of a stay order by the Punjab and Haryana High Court, the district administration swung into action and got vacated 98 acres of the panchayat land from the leaseholders at Murthal village, 8 km from here, on Saturday.